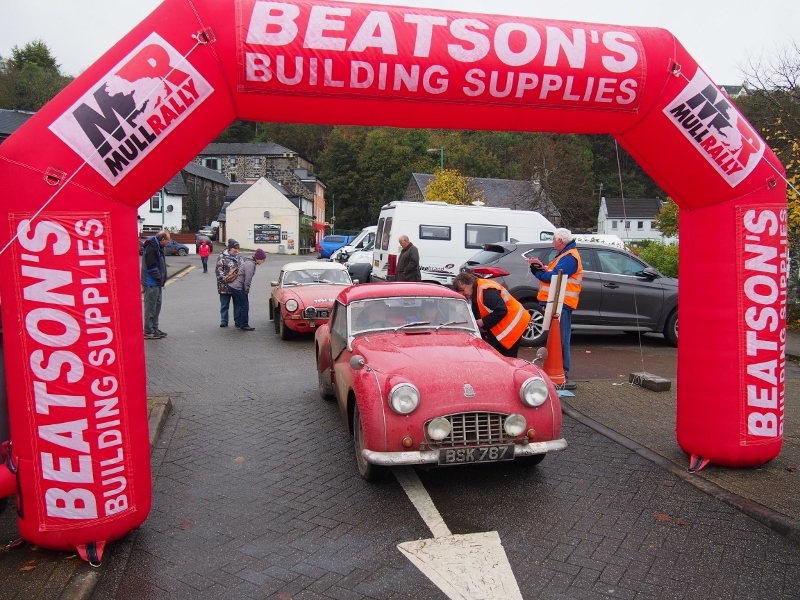 We know who did well on the Beatson’s Building Supplies Mull Targa Rally, but we don’t actually know who has won - yet. Although all the test results have been posted on the ‘scotresults’ website, the penalties have yet to be applied. That’s because they were marked on the Marshals’ Check Sheets and these have to be deciphered and fed into the machine on their return. That machine happens to be in Glenrothes, because due to the wonders of modern electronic trickery, Results HQ is in Glenrothes (on the east coast of the mainland) where Raymond is poised over keyboard to feed in the times from this end, and spew out the computations from his end back to here. Still it marks a considerable improvement over the use of carrier pigeons. Amongst those who have done well are Andy Beaumont and Andrew Fish in the Sunbeam Rapier H120. If you think Historic cars are boring, nobody has told Andy. Scandinavian flicks and tail slides in a car which should be a classic museum piece. On test times he was leading the 1.2 litre Renault Clio of Garry Pearson and Richard Crozier by 39 seconds. 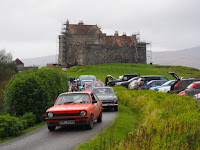 Just 30 seconds behind Garry were Craig Wallace and Clifford Auld in the Toyota Corolla with the Vauxhall Viva of David Ruddock and Dave Boyes only 6 seconds behind them. But as I say, this is entirely theoretical at present as we await final scores. And you know what, it might be tomorrow before Final Results are declared. However, no-one seems too bothered, they all had a grand day out, even those who didn’t finish. The weather stayed mostly dry and there was a sprinkling of spectators at some of the tests including a few folk who fancied a wee shot themselves when they saw it was for standard cars and the tests were fairly short. Ian Dixon was going well in his MGB till the clutch exploded, Keith Robathan’s banger BMW was suffering severial brake fade at times and the family Fleming were all out with punctures. Grant Fleming had a double puncture in his Fiesta and daughter Chloe suffered a double puncture too in her Citroen DS3. AS for Peter Marshall he had invested in a large packet of Araldite: “The spark plug out of the cylinder head on the start line of the first stage,” he said, “it stripped the thread so we’ve stuck a new spark plug in the hole and securing it with Araldite.” I’ll tell you later if they finished.